La Paz is truly one of the few spearfishing paradises, with all year around fair weather conditions and the productivity of its hunting grounds allow spearfishermen of any level, beginner to expert, to truly experience the thrill of a lifetime! In the winter months ( December to end of March ) the water temperatures are relatively low ( around 22 to 24 celsius) the use of a 5 mm wetsuit is a must; for the rest of the year a lighter 3mm suit is going to be perfect ; and in July, August and September ( with the water reaching over 30 celsius) a tropical suit or lycra can be used specifically as protection from the hot sun and possible encounters with the rocky bottoms. Water visibility can be, especially in the winter months, not at its best and in July it is often reduced to a few meters ( due to mixing of warmer and colder water carrying the nutrients that make this stretch of ocean so rich) ; but the added challenge of less transparency can be very rewarding due the fact that in these conditions the fish are easier to approach. 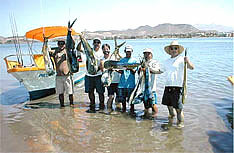 Both blue water hunting and bottom spearfishing are possible in La Paz, even in the same day different species can be targeted using different techniques and different types of equipment; these will be discussed in the “guide by species” that follows. Spearfishing in La Paz is mainly done around the two main islands of Espiritu Santo and Cerralvo and some smaller islands or sea mounts ( el Bajo, el Bajito, la Reina); the depths are normally quite accessible ranging from a few meters to a maximum of 25 meters. A set of rules imposed by the Mexican government are really helping in keeping the area rich in species and a very healthy fishery. Our guides will be sure to inform you on site of everything you need to know. A fishing license and a park permit are necessary when spearfishing in La Paz. Daily , weekly and yearly permits are available and very easy to obtain on site at The Cortez Club. Only rubber bands guns are permitted ( no compressed air or other types) and there is a daily capture limit that is based on a point system depending on the species that are allowed for a very rewarding mixed bag. We advocate for a responsible harvesting of selected catches and rely on the individual’s responsibility in helping keep these fishing grounds productive for years to come. In this guide we concentrate on the most rewarding species that the spearfishermen will encounter in our area. The difficulty level is based on a 1 to 5 points system where 1 represent a relatively easy catch suitable for the beginner and 5 is a very difficult catch that will even test the skills of an expert spearfisher. This majestic fish roams the sea mounts of the area in May and June; with weight varying from 10 to 50 kilos they offer an easy shoot but a very powerful reaction. Long powerful guns are a must and reels charged with at least 50 meters of the strongest line will be used to be able to recover the largest individuals; also attaching the spear directly to the buoy ( trough a quick release system ) is a very good option to be sure to boat a big fighting Amberjack. This is the king of the rocky bottoms, the biggest Pargos can reach 35 kilos, they swim around the big boulders on the sandy bottom or hide in the dark between the rocks. Their reaction once shot is violent , more spears have been broken or bent with this fish than with any other. They are around all year long with peak season in fall and winter months. To stalk them in open water a very powerful , long gun is needed but to try to catch them in the holes a short manoevable gun is a must . This is the fish that offers the most challenging fight of all the bottom catches. The bright colours of Dorados are flashing in the open deep waters around La Paz in the spring to the fall months. Good guiding is in this case very important because schools of dolphin fish move around following baits all over the place; they are very fast fish, not very easy to shoot and their strong fight make them a very rewarding specie to catch. Their meat is excellent and they represent an exotic pray not available in most other areas. Long guns will be used for this species being only approachable in blue open water hunting. Their weight can reach 30 kilos. This is one of the most delicious fish you can eat and a very fun catch too. This grouper weighing up to 18 kilos hangs around the rocks at any depths, from a few meters to the deepest grounds, it offers a shot in open water if we are able to get close to the fish with a very silent descent using a middle size gun or it will be hiding between rocks offering a chance for spearfishermen using a short gun. Its reaction is firry even though not as violent as the Pargo’s. The best period for Cabrilla is April to June but they are around all year. The big Marlin ( striped reach up to 100 kilos and blues can be as big as 250 kilos) can be found on the sea mounts especially during the warmest season. This is a rare occasion to catch one of the truly exceptional spearfishing catches. They may offer an easy shoot due their size but the recovery of a giant offers some very serious challenges. Long very powerful guns are needed, sometimes a second killing shot will be in order to be executed with a shorter more handy gun. It will be necessary to relay on the breakaway system that will have the spear directly connected to the buoy. We strongly encourage our fishing partners to only harvest the best specimen and to be very selective in the case of younger smaller fish to not endanger this beautiful species. Roosters are easy to spot swimming in big schools around the island’s rocky points and the sandy bottom bays. They offer a relatively easy shooting chance but they are strong fighters. Medium to long guns with reels will be used to catch up to 25 kilos fish. This is a rare catch in the bag of any spearfisherman and one that will offer a very exciting challenge. Snook are one of the most delicious fish to eat. They are not easy to find but once we spot a big isolated one (up to 20 kilos) or a small group of smaller individuals , shooting will not offer too much of a challenge and recovery is not hard due the fact that these fishes will not reach for the rocks in an attempt to get rid of the spear. This is one of the best fish dinners you will ever enjoy, the best guiding is here essential to discover the rare sites where it is possible to catch this beautiful fish, medium size guns will do the job. Tunas reaching incredible size (over 200 kilos) can be found in the deep waters rich in bait and nutrients especially in the fall months. In case we encounter one of these giants we have to be sure to be ready with a precise shot and the right equipment for the recovery to happen, in the best case scenario after a long hard battle. The most powerful guns, strong shafts and collapsible points will be used and the use of one or more buoys directly connected to the shaft will be a must. This is a rare catch but one that is worth every hour spent in search of it. Big schools of powerful Yellow tails are easy to locate in the winter and spring months. Sometimes very close to the surface and sometimes at challenging depths. They curiosity makes them not difficult pray to shoot but their reaction is one of the strongest ever. Reaching up to 30 kilos , the biggest specimen swim alone and are more aware of the dangers represented by a spearfisherman stalking them. Good diving techniques will offer a fair shooting chance and long guns with reels will be used to be sure to recover the best fighter in the open water. Their meat is delicious and their capture will be a definite adrenaline rush for the intermediate to expert hunter. Wahoo reaching the world record weight of 60 kilos have been captured on the sea mounts of the north area of La Paz, these exceptional predators offer a challenging shot due their speed and awareness and one of the most violent even if the fight is somewhat short lived. A break release system will help to recovery the biggest specimen and a long gun will be necessary to have a shooting chance during the summer and fall season. The beginner spearfisherman may find it quite challenging to capture one of the pre mentioned species but the rich grounds of La Paz offer a large variety of other prey that will offer a very exciting and rewarding option and delicious eating. In depths starting at only 2 meters, on the rocky bottoms of the island, we will find a big concentration of Trigger and Parrot fish, sometimes huge specimen, Yellow Pargos, Croackers and different species from the Jack family that will assure an exciting spearfishing day and a perfectly fine dinner for even the less experienced or the intermediate spearfisherman wanting to tune his or her diving and shooting capabilities.